Access Information: Turn off the Cabot Trail at Cape North Village onto the Bay St. Lawrence Road. At 9.9 km (6.2 mi), you will pass the entrance to Cabot Landing Provincial Park. Continue another 1 km (.625 mi); look on your left for yellow and blue flagging tape (only signage in 2011). Park on side of road with tires off pavement. 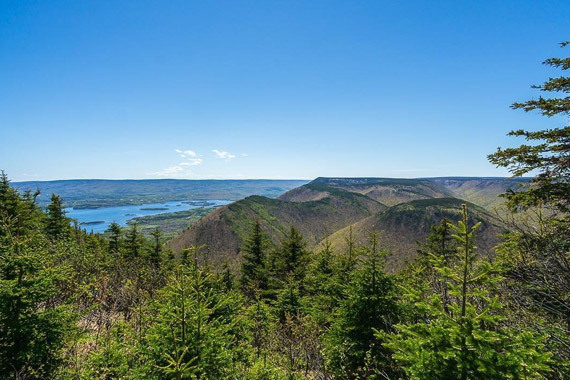 Introduction: There are few stand-alone mountain-tops in Nova Scotia, but one of these is Wilkie Sugar Loaf, climbing to more than 400m/yd above sea level in less than 1.5 km (.9 mi). This peak belongs to the North Mountain range of hills bordering the Aspy Fault, but has been separated from the rest of the ridge by the deep ravines cut by Wilkie and Pollys brooks. This is the shortest route profiled in Hiking Trails of Cape Breton, but one of the more challenging. It involves a steep, unrelieved climb from trailhead to summit, and those who are not regular walkers – and maybe even those who are – will require frequent stops to permit protesting muscles to recover. However, the views from the top are quite literally remarkable. The entire length of Aspy Bay stretches out in a grand vista to the south. Particularly impressive are the extended sandy strips of the North and South Harbour beaches. White Point, another popular hiking destination, can be seen almost in its entirety on the opposite headland of Aspy Bay. And the views west and north are almost equally grand: deep ravines and steep-sided mountains. It is recommended that anyone attempting this hike, especially on hot summer days, ensure that they are carrying an ample supply of water and permit themselves two hours or more to complete the round trip. A favourite time for this hike is in the fall, either when the leaves are at their peak of colour or even later when the neighbouring hilltops are dusted with snow. This trail is on private property, and maintained by local volunteers. Cautionary Notes: Wildlife. Steep climb. Exposed hilltop.